1. What is DataSet in ADO.Net? 3. DataAdapters Properties and Methods. What is DataSet and DataAdapters in ADO.Net? Updating, Inserting and Deleting rows in DataSet. 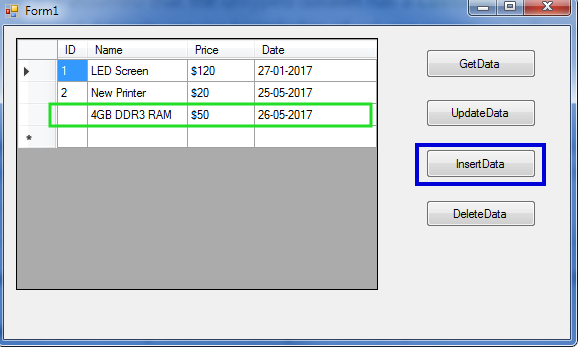 Save DataSet Changes to Database. What is DataSet in ADO.NET? In a simple word, A DataSet is a local copy of your Database Table that gets populated in client PC. It is independent of Data Source and because it exists in the local system, it makes application fast and reliable. Accessing Remote Database each time for updating or retrieving details are time-consuming so datasets help you to keep local database tables on your PC. A DataSet behaves like real Database and it represents a complete set of data that includes tables, constraints, and relationships among the tables. Using the DataAdapters you can fill DataSet and use this dataset for retrieving and storing information. When all the tasks get completed, update Real Database with datasets. DataAdapters are used for controlling Datasets and it provides communication between DataSets and DataSource. DataAdapters make a connection with Data Source and then Fill Data to DataSets. It also Updates Data Source with DataSets. 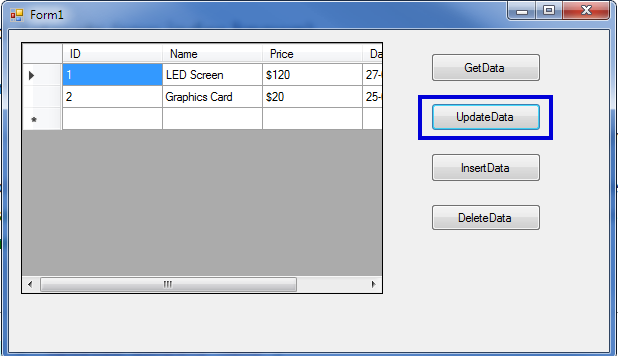 UpdateCommand It is used for Updating Records in a DataSource. TableMapping It is used for mapping actual database tables and datasets. Fill This method Fills Records from DataAdapters to DataSets. Update This method update DataSource with DataSets. Mostly DataSet is used with GridView in ASP.Net. Here, I have explained DataAdapters and DataSets with Examples. Project. 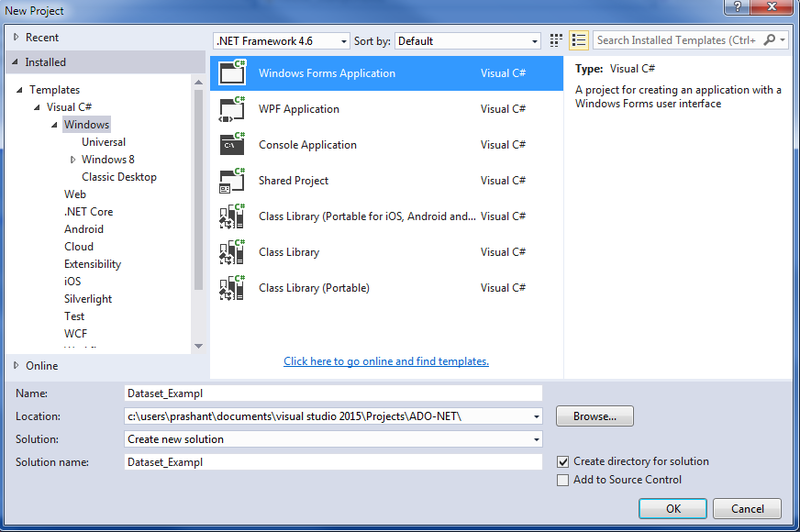 Create a New Windows Forms Application Dataset_Example. 2. 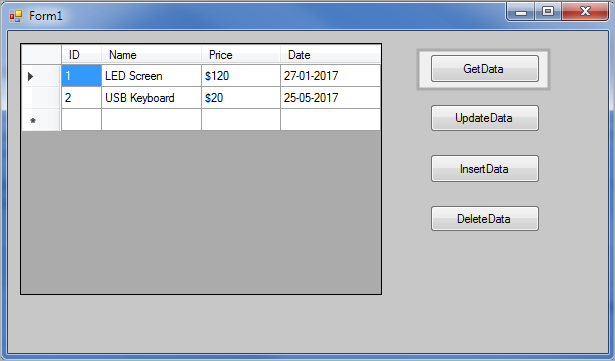 Drag a GridView and a Button like that. After populating dataset, you can update, insert or delete a record from the dataset. Here is a full programming example. If you don’t know row index or unique row number still you can update or edit row in dataset by using following method. 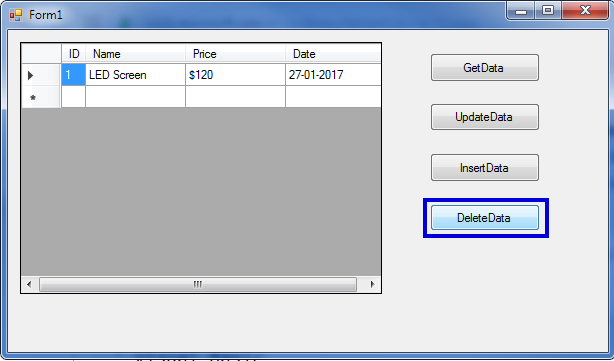 You can delete row from dataset using Delete() Method. After Modifying Dataset, you can save Dataset changes to database. In this chapter, you learned how to work with DataSet and DataTable in C# ADO.Net. 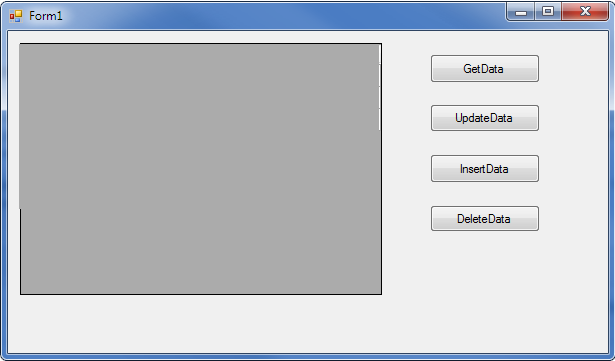 You can locally work with the dataset and after completing all the modification, save back to the database. In the next chapter, you will learn about DataTables and DataView.